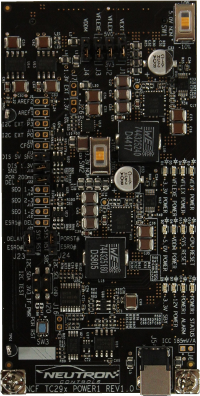 Designed for use with our REDline™ Carrier board, this Module provides the necessary power rails to supply the AURIX™ MCU Platform Module as well as other peripheral Modules and devices. The Module sources +5V, +3.3V and +1.3V from an externally connected +12V power supply. The +5V and +3.3V rails have a selectable ±10% margining capability providing means for thermal and functional qualification. Two high-precision voltage sources provide lownoise and very low drift references for all available AURIX™ ADC peripherals. Multiple options available to configure power rails’ sequencing, MCU and System reset delays as well as reset sources. A separate circuit allows simulation of ESR0 and ESR1 signals. A complete hardware development support package is available including: schematics, BOM, layout, gerbers, PCB stack-up, and low EMI design rules.